The first prong of the HDC’s peace campaign was the ratification of the Bretton-Woods Agreement, which established the International Bank for Reconstruction and Development (IBRD) and International Monetary Fund (IMF). Designed to stabilize the value of currency worldwide, the agreement hoped to end “currency wars”—nations’ use of the adjustable value of their currency as an economic weapon—and increase international economic cooperation and trade. While the HDC saw economic security as a necessary precursor to international peace, they were also concerned about how the agreement might affect their business interests. The HDC, after all, was a professional organization. 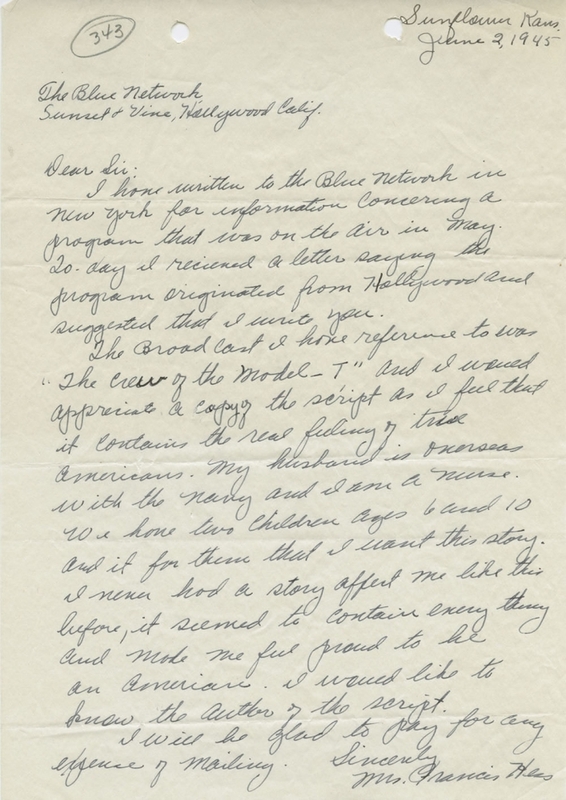 Before the HDC pledged its full support, George Pepper wrote to Secretary of the Treasury Henry Morganthau, Jr., to ask about Hollywood’s economic stake in the ratification. In particular, industry officials sought information on how the agreement would affect their ability to export more films to Great Britain, where regulations governing import quotas limited their profits abroad. Morganthau’s response was so detailed in its explanation of how the agreement could help expand Hollywood’s foreign trade that Pepper used it as a means to convince others, including Will Hays, head of Motion Picture Producers and Distributors of America, to get behind its ratification. Pleased with Morganthau’s attention to the film industry, the HDC (which would soon become HICCASP) also asked him to participate in a massive public performance designed to promote the agreement to a wider audience. In addition to the Treasury Secretary, “The Crew of the Model T” starred Ray Collins, Jimmie Gleason, Paulette Goddard, Rex Ingram and Burgess Meredith. Performed in front of a live audience on April 30, 1945, the show was also broadcast over ABC Blue as part of the station’s adherence to the public service requirements of radio licensing standards. WCFTR’s copy of the show’s script tells the story of four American families spread across the U.S. who come into contact through their sons, who serve together in a Sherman Tank affectionately nicknamed the Model T. Through their correspondence with their sons and other parents, the families learn that their lives and economic interests are intertwined not only with each other, but with global forces: decimated foreign markets need American products, US agricultural productivity and export affects levels of international starvation, and world economic freedom paves the way for worldwide individual freedom. Morganthau’s speech and a request for audience members to write their senators asking for ratification concludes the program. 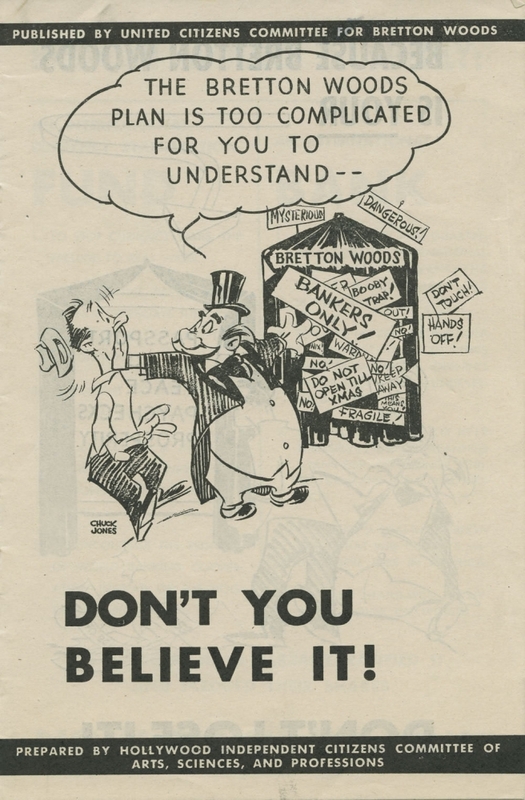 Accompanying the radio program, HICCASP created and circulated printed materials, including this eight-page illustrated brochure drawn by cartoonist Chuck Jones that attempts to explain the intricacies of the agreement to the layperson. Congress ratified the Bretton Woods Agreement in July of the same year. Eichengreen, Barry J. Globalizing capital: a history of the international monetary system. Princeton: Princeton University Press, 1998. Suman, Michael, and Gabriel Rossman, eds. Advocacy Groups and the Entertainment Industry. Westport: Praeger, 2000.